Martin Shkreli Takes The Fifth, But Can't Resist Firing Back : The Two-Way The former pharmaceutical executive appeared before a House committee hearing on drug prices, and for once tried to stay silent. 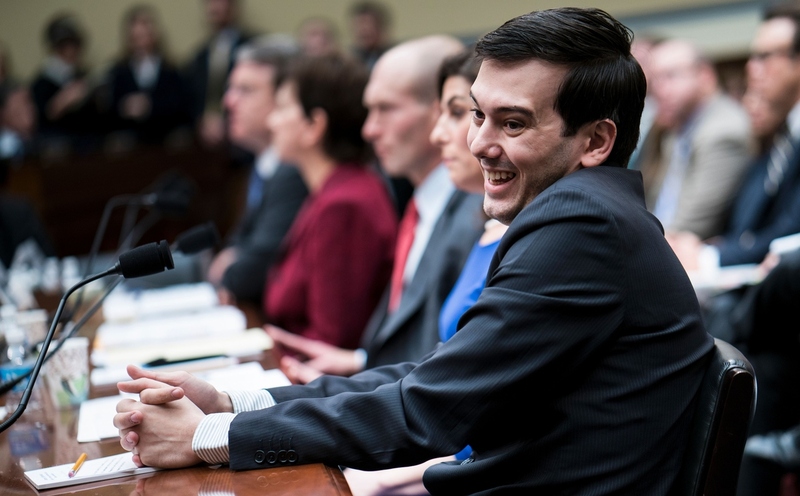 Entrepreneur and pharmaceutical executive Martin Shkreli laughs during a hearing of the House Oversight and Government Reform Committee on Capitol Hill on Thursday. For the first few minutes of his appearance on Capitol Hill Thursday morning, pharma bad boy Martin Shkreli was the soul of decorum. He sat placidly, hands clasped, a polite smile fixed upon his face, as members of the House Oversight and Government Reform Committee fired questions at him. "On the advice of counsel, I invoke my Fifth Amendment privilege against self-incrimination and respectfully decline to answer your question." As the questions dragged on, growing ever more pointed and harsh, Shkreli's fixed smile turned into a kind of incredulous smirk. When Rep. Trey Gowdy of South Carolina encouraged him to talk, Shkreli replied, "I intend to follow the advice of my counsel, and not yours." Shkreli, 32, gained notoriety last year after the company he founded, Turing Pharmaceuticals, purchased a lifesaving drug called Daraprim, which is used to treat HIV patients and others with suppressed immune systems, and immediately raised the price by 5,000 percent. To say the move made Shkreli unpopular is a huge understatement: News outlets dubbed him the most hated man in America. In December, FBI agents showed up at his Manhattan apartment to arrest the baby-faced executive on unrelated securities charges. The Brooklyn-born Shkreli was accused of cheating investors in a pair of hedge funds he operated by lying to them about the value of assets he managed. He was released on $5 million bail. Most people, faced with daunting legal problems, disappear quietly to await the resolution of their cases. Not Shkreli. In the weeks to come, he gave several media interviews, tweeted voluminously and spent hours on a live stream feed of his life. The feed shows him ambling around his apartment in sweatpants and stubble, playing video games, idly strumming a guitar and rating girls on OKCupid. While Shkreli usually stopped short of talking about the fraud charges against him, he made clear he sees himself as the deeply misunderstood victim of overzealous prosecutors and media. In an era when the corporate apology has become an art form, Shkreli used his social media forum to lash back at his critics and settle scores. Shkreli's other claim to fame was as the man who spent $2 million to buy the lone copy of a Wu-Tang Clan album. When one of the group's members, Ghostface Killah, heard about the Daraprim controversy, he called Shkreli an eight-letter word that can't be reprinted here. Not long afterward, Shkreli appeared on video surrounded by three masked figures he called his goons and addressed the rapper directly. "Most people don't try to beef with me. You know why? Nobody's that dumb," he said. On Jan. 21, someone on Shkreli's live stream asked whether coming off like such a jerk was a good idea, given the legal charges he faced. Speaking out against unfair attacks was a matter of personal integrity, Shkreli replied. He was being true to himself. "In many ways, I think we all have choices to make and when it comes to me, I sort of tend to prefer authenticity than to manufacture a personality that is fake," he said. Two days ago, Shkreli announced he had fired his lawyer and replaced him with Benjamin Brafman, best known for representing famous rappers. Brafman laid down one condition: No more media interviews. Shkreli announced several days ago that he would be pleading the Fifth at today's hearing, but the questions Thursday appeared to test his self-restraint. At one point, Rep. Elijah Cummings of Maryland, the ranking Democrat on the committee, said the decision to jack up the price of Daraprim was "blood money." "I know you are smiling, but I am very serious, sir," Cummings told him. Later, Shkreli retweeted dozens of messages from his followers offering support and criticizing the committee members. "He meant no disrespect, but in truth, statements made by some of the members of the committee were wrong, unfair and difficult to listen to without responding," Brafman said. A previous version of this post included a video that was not actually Martin Shkreli but a parody of him.